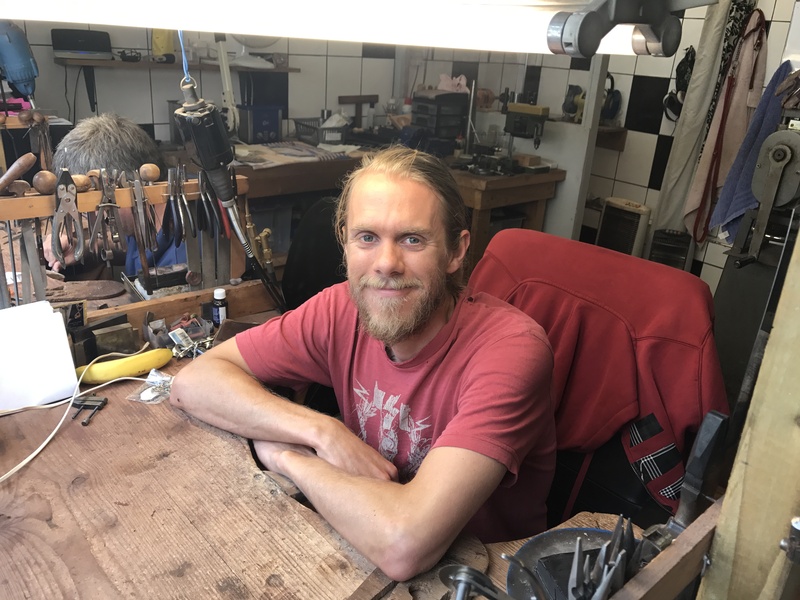 Paul Chapman, apprentice at the Goldsmithy found his love of crafting jewellery when his father, Glenn Chapman asked if he wanted to have a go at the bench. Get to know Paul a little more with this short Q&A. Q. There are so few people hand crafting jewellery nowadays – why was this the career choice for you? A. It was something I fell into. The family needed help with the business. Initially I came on board to redesign the workshop and give it a real casual/living room feel. Dad asked if I wanted to have a go at the bench and I fell in love with the trade instantly! There’s so much to learn – new tools, processes and a constant chance to improve with new challenges which is why I enjoy it so much. Q. What are the challenges you face in the jewellery industry? A. The biggest challenge is making people aware of the benefits of handmade jewellery over mass production. Q. What are the best bits about working in a family business? A. The lack of proverbial nonsense that goes with working for a company. We make up our own rules. It’s the passion we have that makes the business work rather than making sure you look in a certain way and arrive on time. The physical making of jewellery is the important bit. Q. What inspires you in your designs? A. The customer! We ask what they like, what interests and hobbies they have so we can start to design a piece that is personal to the person. Q. 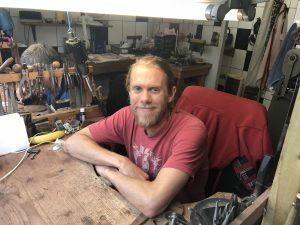 What is the special quality you bring to The Goldsmithy? A. I try for a bit of a giggle now and then. Aside from that, my background is in fine art so I have illustration, graffiti and figure studies in my skillset where I can pull on to design something really creative – plus, I have a younger generations influence in design. Q. What is your favourite piece you’ve created? A. The fairy. It was completely my design and creation. It was sculptured and constantly thinned down to look like a fairy and that eye came from years studying life drawing – the different poses and the beauty in the female form. Q. What is your favourite material to work with? A. I’m learning the differences between metals and 18ct is a really great gold to use. 9ct is only a third is gold and the rest is made up of base metals which make it quite brittle and hard, whereas, 18ct is 750 parts gold which makes it more malleable – it feels better, it rolls better, you get less cracking occur. I am learning to be intrigued by platinum which is harder to work with but the colour of a polished piece if platinum is unlike anything else. Q. What may people not know about you? A. For people that know me, they’ll know I have travelled the world a fair bit. For people that don’t know me, they might come into the shop and think I look a little scruffy but travelling taught me the values of seeing different cultures and how people live and that how you look doesn’t define you. After being hunched over a bench all day, I love to go rock climbing to feel alive with the adrenaline rush! Q. In true British style we have to ask a very important question – how do you take your tea? A. I don’t drink tea on a daily basis but put a chocolate chip cookie with it and I take it with milk and two sugars.